Now that television is no longer necessarily linear, how contemporaneous a show is has become less important. Instead of watching the show that’s on now followed by the one that comes next, we can YouTubeSurf to anywhere – and even any time – we want. So let’s go all the way back to the Seventies and eavesdrop on what they’all were watching back then, when, for half of the decade, South Africa didn’t even have TV yet. It’s The Carol Burnett Show. 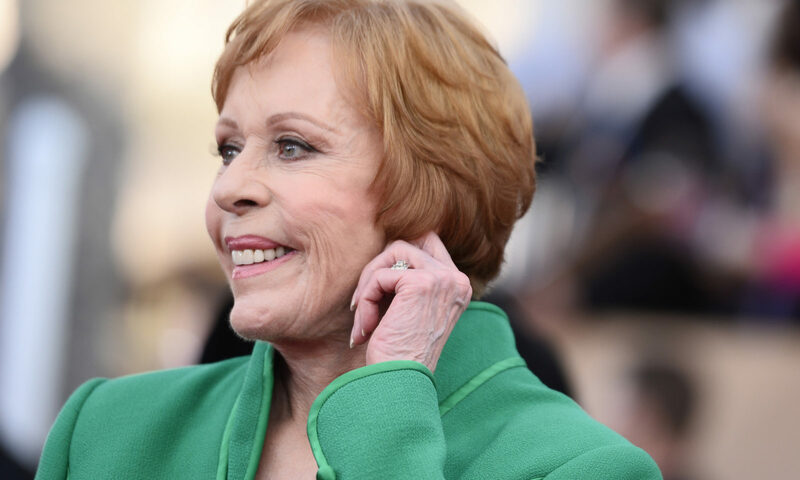 Actually, though, Carol Burnett happens to be as contemporaneous as this week, when a new show starring the venerable comedian and ear-tugger cropped up on Netflix. At 85, she must be the first Netflix star to come out of the much earlier Golden Age of television. And she truly was the star of the show back then when, for 11 annual seasons from 1967 to 1978, she was a real game-changer in a medium – the television variety show – that had been seen as mostly a man’s game. You’ll find many instances throughout her canny and side-splitting sketches where she deftly and subtly scores points for her gender. No tub-thumping, scowling preachiness for her; rather, tickle and prod them into submission, then put on your haughty frown. And no one could put you into back in your box with just one twitch of a facial muscle or flash of an eye quite like Carol Burnett could. I have to admit I was sceptical when I saw that her new show has loads of kids in it. It’s not at all what you might have expected. But give it a go, because it does start to make sense, when you consider her massive career, which began as early as 1955 – yes, nineteen fifty-five – and then you realise, hang on, she’s making herself and her past catalogue familiar to kids who weren’t even born in the 1900s. She’s ensuring that these kids will grow up knowing her, and take her legacy into their own future. Genius! In a delicious outtake in the first episode of a LITTLE HELP with Carol Burnett, new on Netflix this week, she leaves the studio to be seen in her supposed job interview with Netflix. “Netflix Job Interview Candidate 0426” gets assessed by a stern little boy who, after an amusing exchange, says she can do the new series and, oh by the way, “stay woke”. Bang. Carol Burnett is back. What kid isn’t going to want a woke great granma? In a LITTLE HELP with Carol Burnett, there’s a panel of very smart kids, some more appealing than others, who have to give advice to a guest celebrity who invents a “problem” they’re expected to solve. The first guest is Lisa Kudrow (Phoebe in Friends) whose “problem” is that she has double-dated herself for a lunch appointment and doesn’t know how to get out of it. It’s premised on the fact that children are honest, will blurt out what adults will think twice about saying, and it helps that the kids who have been chosen are pretty sussed about a lot of stuff. Is it a kids’ show for adults, an adult show for kids? It sits somewhere between … there are things adults will laugh at that will go over the children’s heads, whereas children are likely to laugh at pretty much everything. Anyway, this took me off on a very enjoyable tangent this week. I’ve been wishing for years that the original The Carol Burnett Show would be rerun somewhere, and some effortless googling and YouTubing via my Apple TV to my flatscreen took me to a whole world of Carol Burnett shows, then and now, and even some in between. So I’ve been on a bit of a Burnett Binge this week. I recommend it highly. There’s an entire The Carol Burnett Show Official slice of YouTube, it transpires, to which you can subscribe at no cost. Time Life via YouTube hosts countless full sketches from all 11 seasons, and there are even entire episodes compiled by whoever is behind ‘Executive Decision’, who also offer the Sonny and Cher Show (ask your gran). Also google “Carol’s Crack Ups” or go to www.CarolsCrackUps.com for yet more of the funny stuff. And if all that isn’t enough, do a title search of, say, “Carol Burnett charwoman” for those signature sketches of her cleaning lady character, memorably the focus of her own animated opening and closing credits sequence. Or add a celebrity name to hers – a search of “Carol Burnett Maggie Smith” brought up wonderful duets from 1974 and 1975 so that the kids and not-so-kids of today can see what the Dowager Countess of Downton Abbey used to look like. Pretty gorgeous, as it happens. Also google “Carol Burnett Maggie Smith I’m a Limey Now”. Inevitably, some aspects of The Carol Burnett Show are dated. That’s what time does to us all (20 years from now the teenagers of today will be embarrassed when their kids see how they dressed or behaved or wore their hair). The costumes, especially, shift from late Sixties to late Seventies, and that marked quite a shift in fashion from mini skirts and teased hair to maxi dresses and the beginnings of the Big Hair that would come to define the Eighties. Anyway, fashions leave us and come back, not always to haunt us. The Twiggy/Jean Shrimpton kohl eyes of the Sixties are the New Big Thing right now, did you know? Not making that up either. (Twiggy/Jean Shrimpton? Ask your gran.) And kohl was an ancient Egyptian cosmetic, so there truly is nothing new under the sun. Burnett, as well as each new season of what remains one of the most memorable and landmark series in television history, did one or more “specials” each year, which were one-off variety shows such as, say, a Christmas special; today’s equivalent, especially in the UK, is the annual extended stand-alone drama that comes out as a Christmas special for shows such as Downton Abbey and Call the Midwife. And guest stars, and music routines (Burnett could sing and sort of dance too). Mel Tormé (ask gran) guests on one show, singing Hurry On Down (to my house, baby), such a dreamy, satin voice; eat your heart out, Michael Bublé. Then there are Burnett’s many characters. The charwoman, the not-so-bright Mrs Wiggins, the ever-grouchy “Family”, and random characters such as her parody of Joan Crawford (ask your great gran) wearing shoulder pads. So, again, fashion tends to repeat itself, and the fashion signature of the Eighties was just the comeback of a 1940s fashion. Oh and her regular co-stars, like Lyall Waggoner, Vicki Lawrence and Harvey Korman. One skit has the effortlessly funny Waggoner showing Mrs Wiggins how to paint a wall, and she’s up a ladder, and he’s unavoidably staring at her posterior. That one’s called Ol’ Paint. And you’ve got to google the Kidnapping sketch, and Toilet Tissue, and Hardware Store, and Mother’s Helper, and Vaccuum Salesman, and Funt and Mundane, and a personal favourite sketch, Old Flame. How to describe that Burnett voice? Somewhere between a warble, a scream and a yelp, or having a mouthful of water and marbles while trying to yodel; boy does she have pipes and know how to use them for maximum comic effect. The Carol Burnett Show is of its time. It’s a window into the world of the Seventies in the United States, it’s a true slice of life, and for a boy who grew up without television, because the dark-hearted draconian patriarchal apartheid bastards decided that television would “deprave the morals of the youth” – and that would be funny if it weren’t such a desperately dire and condescending moralistic stance – it’s a fascinating glimpse into what a young life might have been like back then. Bear in mind, here, that Burnett’s show started in 1967 and ended in 1978… when we had had television in South Africa for barely two years. It’s far from being the gravest of apartheid’s manifold crimes – a trivial afterthought by comparison – but it does show how insidious apartheid’s tentacles were, interfering in all aspects of the lives of the South African people.